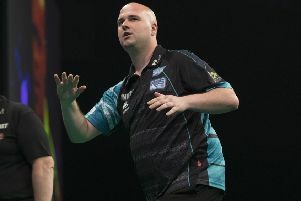 Rob Cross was in action for England at the Betway World Cup of Darts in Germany at the weekend. The world champion from St Leonards joined forces with Dave Chisnall in a new-look England team which won two matches before being knocked out in the quarter-finals. Round one consisted of just a best-of-nine legs doubles match and England held off a Czech Republic fightback to record a 5-3 win on Friday night. The Englishmen raced into a 4-1 lead before Karel Sedláček and Roman Benecky won back-to-back legs to put the pressure on. England struck an impressive 13-dart leg, however, to seal victory. In round two the format changed to two best-of-seven legs singles matches, followed by a pairs decider if the scores were level. England avoided an upset against Singapore on Saturday night, holding their nerve under pressure in the doubles to edge through 2-1. Crowd favourite Paul Lim rolled back the years once again with a magical display to beat Cross 4-2, posting a career-high 102.29 average in the process to give Singapore the advantage. Seventh-ranked Chisnall kept England in the tournament with a 4-2 defeat of Harith Lim, firing in three maximums and hitting a sublime 142 checkout to force a doubles decider. The upset looked back on the cards as Singapore grabbed the first leg only for England’s class to shine through as they rattled off four legs in a row. England’s progress was halted, however, by a 2-1 defeat against Belgium yesterday (Sunday) afternoon, despite Cross putting them ahead by winning the opening singles. Cross averaged 107 in a high quality display to defeat 14th-ranked Kim Huybrechts 4-2. He won the first two legs, the second of them in 14 darts with the help of a 180, before Huybrechts pulled one back by finishing 82 in two darts with Cross waiting on 40. Cross produced a 13-darter to lead 3-1 and although Huybrechts replied with a 13-dart leg of his own, Cross sealed victory with another 13-darter, this time featuring a 180. Chisnall then lost 4-3 to world youth champion Dimitri Van den Bergh, however, and Belgium impressively clinched the deciding doubles 4-0 aided by three Van den Bergh 180s. Cross missed a dart at double top for a 142 checkout in the final leg.